After finishing the Guinness, I made my way to the Tourist Office where I was given maps to all the islands: Inishmore, Inishmaan, and Inisheer. I plan to visit the other two next week. The four mile walk and the Guinness had done me in. I asked the driver of a tour bus to give me a ride to Kilmurvey, thinking he was waiting for passengers and it would cost just 3 Euros. He looked at me but didn’t speak. “Do you want me to wait for more people to show up?” I asked him. “But there’s only youself,” he answered. I assured him I would pay him and off we went, me up front in the seat next to him. He told me he had been a fisherman, but since only the big companies succeed in fishing, he drove a tour bus. I had to listen hard as his English sounded more like the Irish I had heard on the ferry, the words melting one into the other. We spoke of the type of fish found in the waters off Inishmore, prawns and lobsters mostly at this time of year. As we went past livestock, this time on the upper road, the talk turned to testicles, a conversation that lasted for several miles. He said before vets were available on the island, the balls of the bulls were cut off with a knife. In another method, the testicles were tied until they fell off. I threw in, “Well maybe that was more humane, less painful.” He laughed and commented, “Not if you were a bull.” He said there was one man in particular who would come around and do the deed. I told him that Carlo Levi, in his account of being exiled by the Fascist to the hills of Italy, had described the same set up but with pigs. One day a year, a “specialist” would arrive in town and all the women would bring their pigs to the square for ball removal. His final contribution was to mention that he heard in Wyoming they ate them. He chuckled and shrugged his shoulders. Why Wyoming, I wondered? 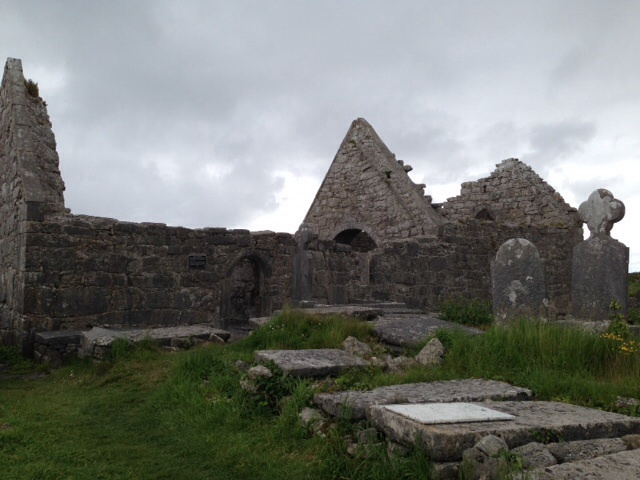 He convinced me to visit the Seven Sisters, a monastic ruin, before going home. According to him, it had been destroyed by Cromwell, the cause of much horror in Ireland. I climbed among the buildings under an overcast sky. It seemed a place for Druids, not Christian monks. But the Irish never let go of their myths or pagan rituals just to accomodate the Pope. I guess he wanted to earn more than 3 Euros and so he did. I see him almost every day on the road taking busloads of day trippers to the various sites. He doesn’t wave at me as most of the drivers do when they pass the only person walking.